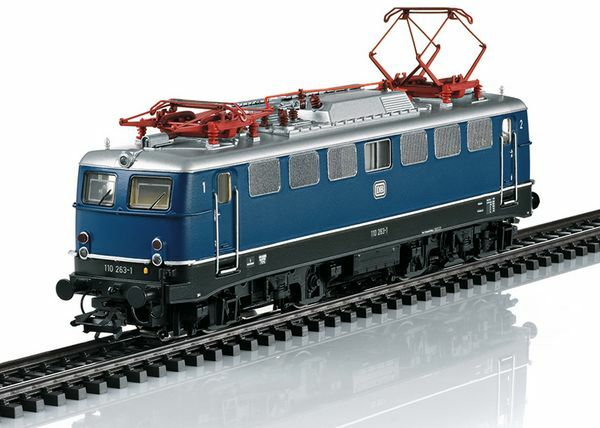 Prototype: German Federal Railroad (DB) class 110.1 electric locomotive. Includes five lamps (double lamps below). Double forced air vents with vertical fins and rounded engine room windows. Includes a continuous rain gutter. Cobalt blue / black basic paint scheme. Road number 110 263-1. The locomotive looks as it did around 1973. Model: The locomotive has an mfx+ digital decoder and extensive sound functions. It also has controlled high-efficiency propulsion with a flywheel, centrally mounted. Four axles powered through cardan shafts. Traction tires. The triple headlights and dual red marker lights change over with the direction of travel, will work in conventional operation, and can be controlled digitally. The headlights at Locomotive End 2 and 1 can be turned off separately in digital operation. When the headlights at both ends are turned off, then the "Double 'A' Light" function is on at both ends. Warm white and red LEDs are used for the lighting. The locomotive has separately applied metal grab irons. Brake hoses and coupler hoses that can be mounted on the locomotive are included. Length over the buffers approximately 18.9 cm / 7-7/16". World of Operation mfx+ digital decoder and extensive light and sound functions included. 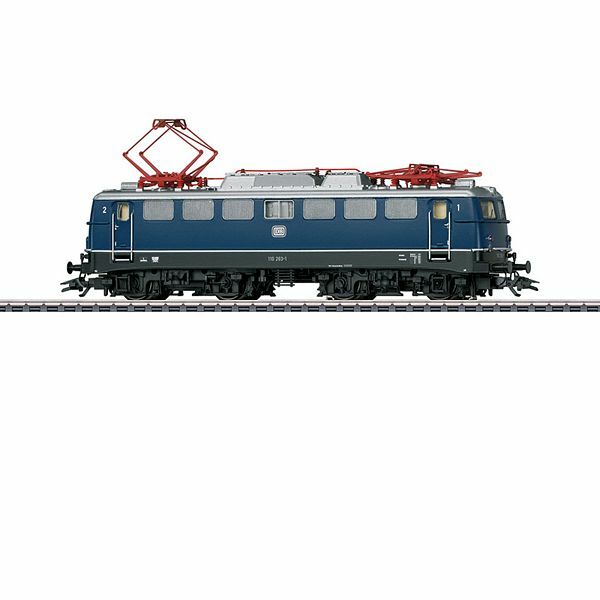 Passenger cars to go with this locomotive can be found in the Märklin H0 assortment under item numbers 43897, 43898, and 43899.